Kennedy further stated that, “VAC-U-MAX was founded in 1954 with the world’s first alternative-energy vacuum—one that operated on compressed air instead of electricity—for safe operation in the textile mill industry of New Jersey. The safe design of our equipment is part of our DNA. We did not need regulation to hold us to a higher standard. We opted for the full 3rd-party testing process for our industrial vacuums. We did not like the self-certifying option that is available in the ATEX standards, and some of our customers don’t like it either,” said Kennedy. 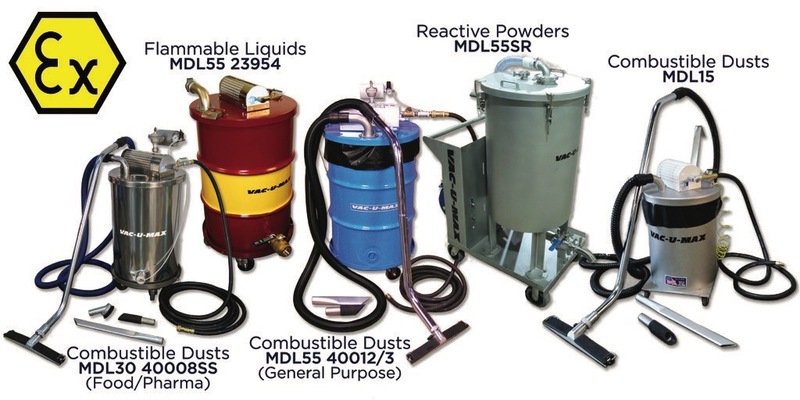 VAC-U-MAX received ATEX approval for three product ranges of compressed-air-powered vacuums: the CD SeriesTM for Combustible Dusts, FL SeriesTM for Flammable Liquids and SR SeriesTM for Submerged Recovery applications such as reactive metal powders from 3-D printing and explosives used in ordnance production. VAC-U-MAX is a UL-certified designer and builder of control panels. Where UL standards exist, VAC-U-MAX is in compliance. ATEX certification was a necessity as UL did not have a standard for non-electrical equipment in explosion-hazard environments.